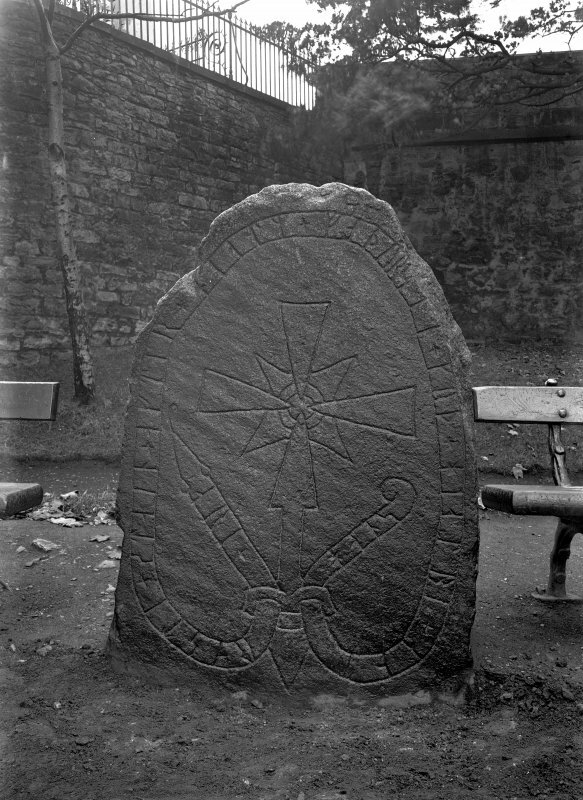 View of Swedish runestone in Princes Street Gardens, Edinburgh. View of the Rune Stone. View of N face of the rune-inscribed stone. Place of discovery: Little Ramsingarde, Westmanland, Sweden. Present location: set upright below the Castle Esplanade in the south-east corner of Princes Street Garden. Enclosed within the high railing which separates the zone reserved for the supports for seating for the annual Tattoo from the public Gardens. Evidence for discovery: brought from Sweden and presented to the Society of Antiquaries of Scotland by Alexander Seton before 1822. Present condition: weathered and damaged at the top. The carving has been picked out in red paint. This substantial boulder has been carefully dressed to a flat surface on one broad face, leaving the others very rough. Deeply incised on dressed face A is a cross with expanded wedge-shaped arms, a central ring and triangles between the arms. 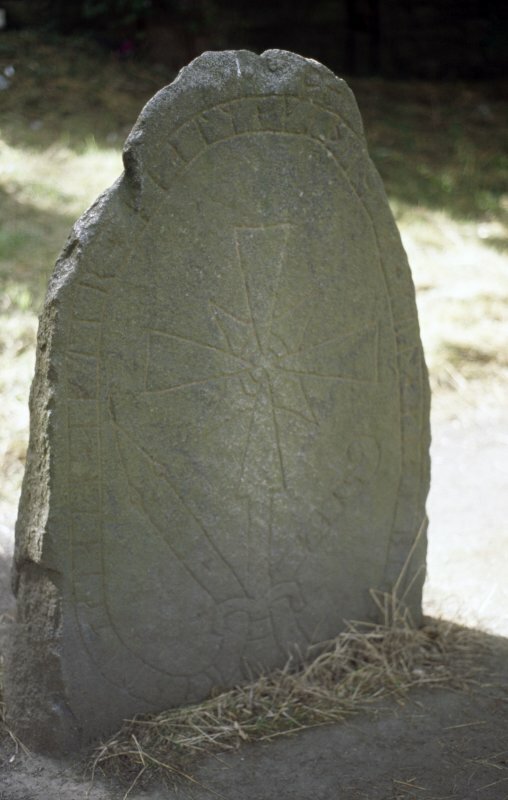 The shaft terminates in an expanded point, which is ‘tied’ by bands to the ends of a ribbon bearing an inscription in runes, which reads ‘Ari put up this stone in memory of his father Hjálm. God help his soul.’ At some period the runic letters have been picked out in red paint. The lower part of face B appears to have been slightly dressed and bears a roughly incised equal-armed outline cross with expanded arms, a central pit, and a shaft, also picked out in red paint. The style of carving on the two faces is quite different and the crosses may not be contemporary. The 1822 account of the stone states that ‘On one side of the stone, there is another figure represented on the plate, the meaning of which is not understood’, which suggests that the cross on face B may be a nineteenth-century enhancement of an original carving. References: Archaeologia Scotica 2 (1822), 490-1. This runic stone, a block of granite, was brought from Little Ramsingarde, Witting parish, Westmanland, Sweden by Sir Alexander Seton and presented by him to the Society of Antiquaries of Scotland, who had it set up in its present position in Princes Street Gardens. The runes, of c. 10th century date, read "Ari engraved this stone in memory of Hialm his father. God help his soul." A deeply incised stone, markings outlined by red paint. Of no local archaeological value. Visited by OS (J L D) 28 December 1953. This stone is a facsimile and of no archaeological interest. Visited by OS (S F S) 28 November 1975. Standing stone with incised carving on front (N.) side and on W. side. 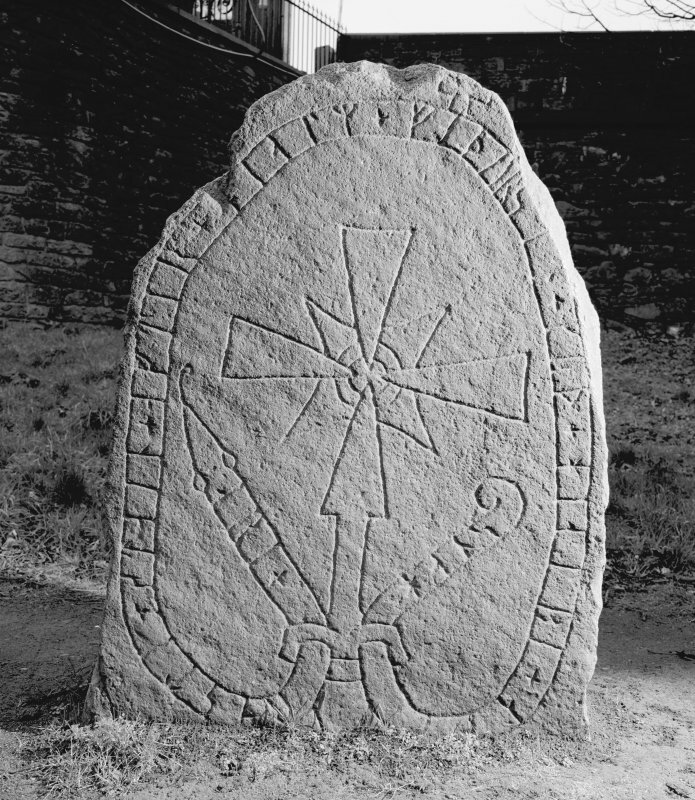 Front carved with a processional cross and a stylised serpent in which is an inscription in Swedish. Side carved with a plainer cross. Inspected By : T. S.